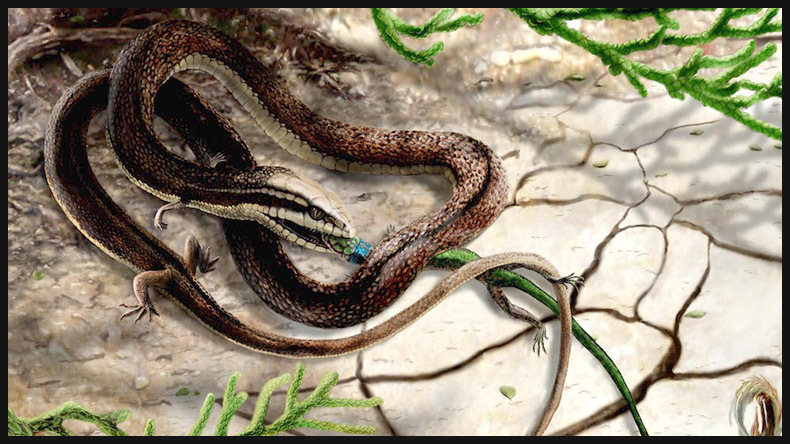 New York:The discovery of a four-legged fossil of a snake in Brazil’s Crato Formation suggests that this suborder may have evolved from burrowing, rather than marine, ancestors. The unique four-legged specimen found gives more insight into how these creatures evolved into the sleek reptiles that we are familiar with today. By analysing both the genetics and the morphological features of this species compared to other known snake species, the authors said that the four-legged creature is in fact an ancestor of modern-day snakes. “We’ve found the ancestor of all snakes. We have found the missing link between four-legged lizards and snakes,” co-researcher David Martill, a professor of paleobiology at the University of Portsmouth, Britain was quoted as saying in Live SCience. The study appeared online in the journal Science. “The newly discovered species Tetrapodophis amplectus, which lived during the Early Cretaceous 146 to 100 million years ago, maintains many classic snake features, such as a short snout, long braincase, elongated body, scales, fanged teeth and a flexible jaw to swallow large prey,” Martill said. The main and glaring difference is Tetrapodophis’s four limbs, which seems not been used for locomotion. The limbs were used for grasping either to seize prey or to clasp during mating. The specimen lacks the long, laterally compressed tail typically found in aquatic animals, further suggesting that snakes did not evolve from marine ancestors. Thus, this intriguing fossil hints at how snakes eventually slithered their way into the modern world.